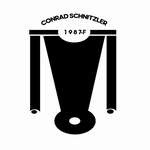 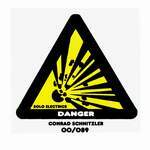 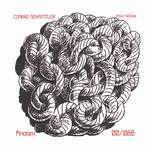 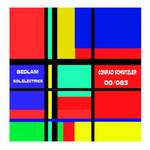 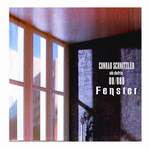 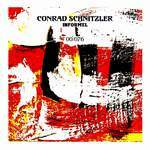 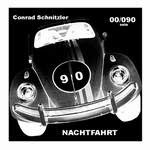 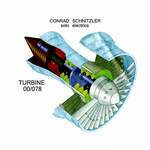 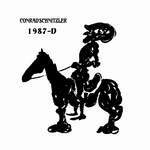 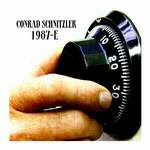 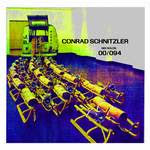 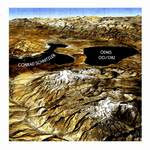 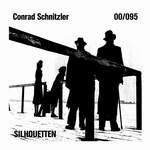 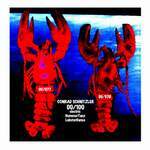 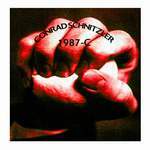 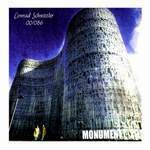 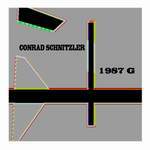 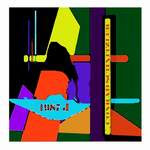 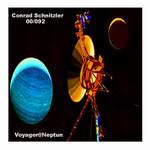 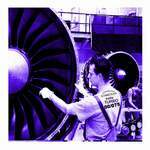 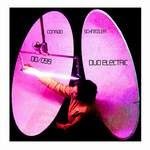 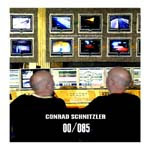 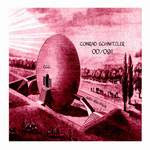 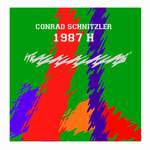 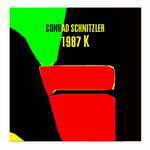 check out this site for the CONfusing discography of Conrad Schnitzler. This one has no image and is listed as "83A 30.3.83 upspeed 30.3.83-5.5.83 1-24 60 min"
Green boxset issued in a limited and numbered edition of 100 copies. 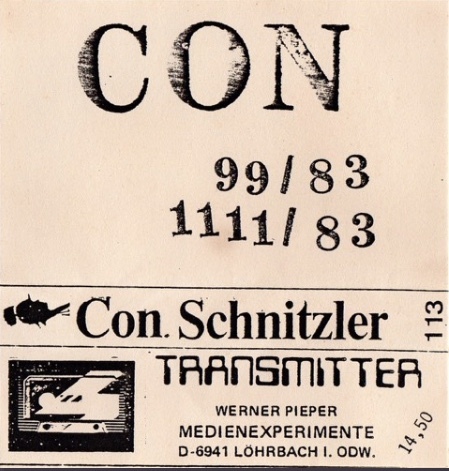 Numbering appears both on the inside of the box, on the enclosed unique cassette and on a signed original drawing (score) called "Kompositionsschema für sechs Spuren (Stereo)". 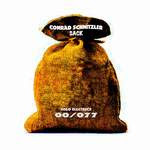 Copies 1-20 are clothbound and contain additionally six more signed and numbered score inserts. 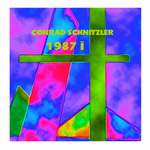 The box contains copies of Schwarz (1971), Rot (1973) & Blau (1974) complete with covers. 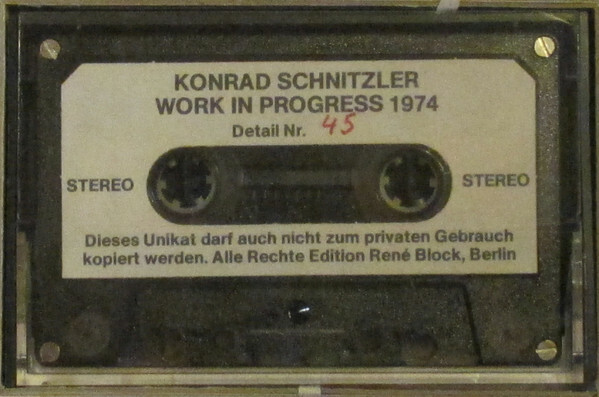 Each box also contains a unique cassette with a different 30 minute excerpt from the 50 hour composition "Work In Progress" that was performed between April 12 and April 27, 1974 at Galerie René Block (3-4 hours per day, 5 hours on the last day). The box contains a list when the contents of each cassettes were performed. 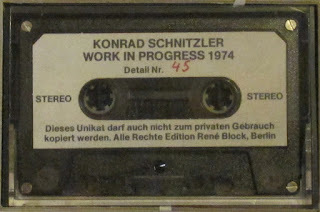 Disclaimer on the tape label "Dieses Unikat darf auch nicht zum privaten Gebrauch kopiert werden. 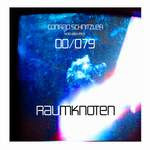 Alle Rechte Edition René Block, Berlin" (translated: "It is not allowed to copy this unique item even for private use. 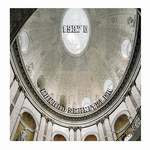 All rights reserved by Edition René Block, Berlin". 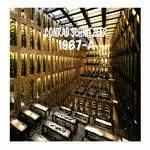 The inner box tracklisting lists LP-Blau A as "Die Rebellen Haben Sich Hinter Den Bergen Versteckt".